This is a scenario from the Charles Grant and Stuart Asquith book Scenarios for all Ages. The scenario map from the book is shown above, which as you can see uses a 7' x 5' table. I myself will have to make the scenario fit onto a 6' x 6' table, but this shouldn't cause any problems. 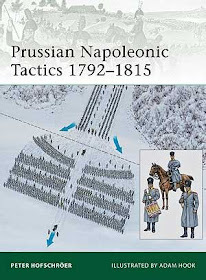 The idea is that the Red force (which will be the Austrians in my refight) has been pursuing Blue force 2 (the Prussians) with the object of bringing them to battle. Unfortunately this has brought Red force too deep into enemy territory and it now encounters two further Blue forces (1 and 3). Red is now outnumbered 2 to 1 and in danger of being surrounded. Red forces must breakout or be encircled and destroyed. The terrain symbols are fairly obvious: the rounded, dotted shapes are small hills, and there is a stream to the south-east. I have no stream sections so this will be shown by a meandering line of bushes and trees representing the vegetation along the stream banks. The various forces are set up in their deployment areas as shown on the map. One thing missing from the scenario as published is detail on what formations and facing are assumed: for example, is Red force in column, still chasing Blue and so facing north-west? Or have they deployed into an all round defence? I decided to lay out the terrain and then deploy the forces as seemed reasonable, trying to give a mix of formations and facings to provide a challenge to both players. Thus all forces would be set out on the table by me before the start of the game. Once my opponent arrived, the highest roller on a dice would get to play the Prussians. This would also have the advantage of getting the game started quickly. If Red has lost 7 to 17 stands, the game is drawn. 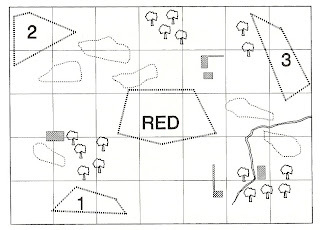 The course of the game is shown in the subsequent shots. I deployed all the forces before Paul arrived as already mentioned. Order of movement of the 4 participating forces was decided each move by dice rolls. Terrain set up and opening dispositions. Austrian intentions start to emerge. They are heading for the east table edge, but do they also intend to attack Prussian Force 3? Their cavalry is about to be charged in flank by the Prussian dragoons of Force 2. The Austrian Cuirassiers distinguish themselves by not only turning to face and countercharging, but winning the following melee. This only gets them into more trouble as their accompanying dragoons abandon them for the attractions of the table edge. They are left facing Prussian Force 2 alone. Hungarian infantry cross the stream with dragoons from Force 1 in hot pursuit. Prussian Force 3 is under command of a deficient brigadier, and doesn't move much the whole game. The Austrians of 1st Battalion, IR10, confront them supported only by the artillery. In this way the Prussians are held off, though IR10 will pay the price by eventually being destroyed. The Prussians are closing in. The Austrian cuirassiers have predictably been destroyed in their melee, but their gallant action has delayed the Prussian cavalry of Force 2. They now hasten to catch up with the retreating Austrians. One Austrian battalion has already escaped over the baseline. The 1st Battalion of the Hungarians is forced to turn and engage pursuing dragoons in a desperate melee at the stream, in which they manage to force back the cavalrymen and gain some breathing space. Overview as the game enters its final phase. The Hungarians of regiment Josef Esterhazy make their final dash for the table edge, along with the artillery. The leading Prussian infantry (from Force 1) are almost up with them. Prussians of IR1 form line for a farewell volley at the retreating Hungarians. Prussian cuirassiers of KR8 hope to make a final charge into the rear of the disappearing Austrian artillery. in the final action of the game. The Austrians have gone. Final dispositions of the Prussian forces. After 9 moves the Austrians have left the table and have lost 15 stands. The game is therefore drawn. On the evidence of this game, an Austrian victory would be tough to achieve. Losing only 20% of your force in the retreat would need excellent tactics and a bit of luck. On the other hand, the Prussians came quite close to winning this game, and they seem to have the easier task. Nevertheless, this is an interesting and fun scenario. Actual playing time was 2.5 hours.